Is your young athlete ready for the pressure of a last second, do or die shot? 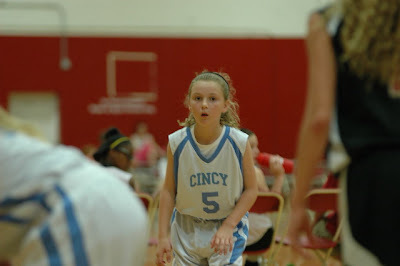 Yesterday, my daughter CC played a pool play game in the 2011 GBA Nationals Tournament. While her team does not really have established positions, CC typically plays the 2 guard or shooting guard. My daughter is one of the smallest players on the team and really needs to be on her game to get playing time against teams that play an aggressive, physical man to man defense. She shines when teams play a tight zone to prohibit our big girls from getting the ball inside. Yesterday, CC struggled to get minutes, but she did get involved in the most important 3 seconds of the game. The team was losing by 3 points with seconds left on the clock. The team forced a turnover and the coach called timeout with 3 seconds left. The team huddled around the coach. The coach picked out 4 of the biggest girls on the team then looked around for CC. She then pulled CC by the uniform and said, "CC you are in". Then she devised a play to free up CC for a potential game winning shot. CC is regarded as one of the best outside shooters on the team. The thinking was that our star player would be double teamed and CC would be open. The play did not work as planned, CC's path to the planned shooting spot was block as she ran toward the inbound passer, so she improvised and went the other way. She got the ball and had time and space. A defender flashed out. CC rushed the shot. She did not get her legs under her and the ball hit the backboard. That was a new situation for my daughter. A learning situation for my daughter. She was not upset about missing the shot, she was proud that she was selected to make it. After the game I told her that 3 seconds is really a long time. I had her say out loud - one, one thousand, two one thousand, three one thousand. Each time she will get better. We have never practiced the last second shot at home. We will start doing that now.